Find East Nassau Real Estate Listings in the Bahamas below! The East and Eastern Road are home to the majority of local Bahamians, old family homesteads and established neighbourhoods. 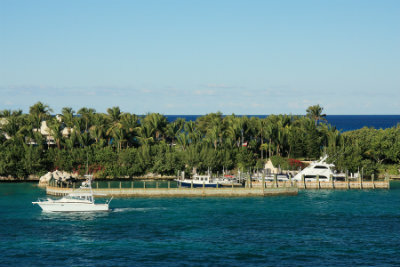 It is also home to perhaps the best boating communities in Nassau, given it's easterly location and proximity to the weekend mecca of Rose Island and also providing the quickest and most direct route to the Exuma Cays. Experience the supreme luxury and serene beauty of the Bahamas island paradise! Browse real estate listings on Nassau's eastern side or read more about the large estate homes to be found on this part of the island below. The Eastern Road runs from town to the eastern tip of the island and is lined with ocean front homes on the northern side offering stunning estate properties with fantastic elevations and views. Eastern Road is simply the eastern end of Bay Street, which runs the entire northern coastline. If you're driving along the north coast you are always on West Bay Street, Bay Street (downtown) or Eastern Road (East Bay St). From downtown just follow Bay Street with the sea on your left. This picturesque and comforting meander along the northern coast of Nassau is dotted with large estate homes featuring hand laid stone walls from a bygone Bahamian era. Colonial architecture is predominant and homes are situated on larger than average plots of land. Eastern Road is perfect for those who like the privacy and freedom of a large estate home. Off Eastern Road are many communities and neighbourhoods, each with their own character and appeal and there are homes of every price range. The East is completely self-sufficient, with The Mall at Marathon, multiple food stores, Harbour Bay Shopping Center, schools, including St. Andrew's International School, doctors and more. Port New Providence, and Treasure Cove are two special, gated eastern communities, Port New Providence with its canal front living and Treasure Cove which offers the best value around! If you are looking for a Bahamas estate home, let Dupuch Realty help. As true Bahamas insiders we know what's available on and off the market. Put our knowledge to work for you, get in touch, today.